Hair here, there and everywhere... Coming out in clumps, clogging bathroom sinks, leaving endless trails on the floors and on your person, there are signs on your pillow, hair accessories... all over. What is the common reason for hair loss? More often than not hair loss is nothing but a signal of internal imbalance. It can arise out of poor health, lack of proteins and minerals in our diet and stressful lifestyle. However, once the reason for the signal is determined and treated, our hair goes back to its normal pattern of shedding and growing. What are the various types of hair loss? When should one consult a trichologist? 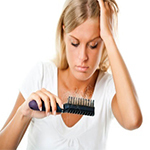 Hair loss is a delayed reaction because the cause of loss generally occurs three months before the actual hair loss. Some internal imbalance pushes the growing hair, which is in the anagen phase, prematurely into the catogen and telogen phase. The hair, thus, enters the telogen phase before their time. They rest in the telogen phase for about three months and then fall out. We then start to worry three months after the actual cause has occurred. So, when you are losing hair you need to look back by three months to determine the cause of loss. More often than not, once the imbalance in the body is rectified, the hair loss will automatically stop. However, if your hair loss persists beyond three to four months, you have a serious problem on your hands and it is time to see a trichologist as soon as possible. What does one need to include in diet to get good hair? Calcium-rich foods like dairy products, yeast, nuts, tofu, beans and green vegetables, palak, paneer, milk, almonds, soya, etc are considered as hair foods. Include items like grains and beans as they have copper. Can you share some tips for children's hair care? Children need to be put on a diet that is full of protein, zinc and minerals, all of which are known ingredients of hair. Ensure that hair remains clean at all times. Wash and oil their hair regularly. Make them consume sufficient liquids and water. Avoid playing around with your child's hair in terms of style. Let the hair in easy styles and avoid accessories that are tight and pull at your child's hair. Tight ponytails, pins etc causes Traction Alopecia which is common in children. Hence, we should avoid all these. Dr. Apoorva Shah is among the leading trichologists of India. He is also the founder of Richfeel Trichology Centres.